It’s late on a Monday afternoon and James Kinoshita is sitting at home in Hong Kong’s Sai Kung district with his son, Andrew. Overhead is a tile roof that slopes towards a garden of blooming azalea and bougainvillea; just beyond are the placid waters of Port Shelter. James bought the property in 1976 with his wife, Lana, when he was a partner with Palmer and Turner, Hong Kong’s oldest architecture firm, and Lana was a sought-after interior designer. “It was a weekend home at first,” says James. “A work in progress,” adds Andrew. Needless to say, Sai Kung was a very different place in the 1970s. It was only a fraction as developed as today, though the Small House Policy had recently been enacted, leading to a spread of three-storey village houses across the district. Achieving that meant dealing with a building code designed to encourage the construction of identical boxes, not anything unique. There was a height restriction of 25 feet; no single floor of the house could be larger than 700 square feet. James solved the problem by building two houses and linking them together with a covered terrace. James is no stranger to dealing with constraints. 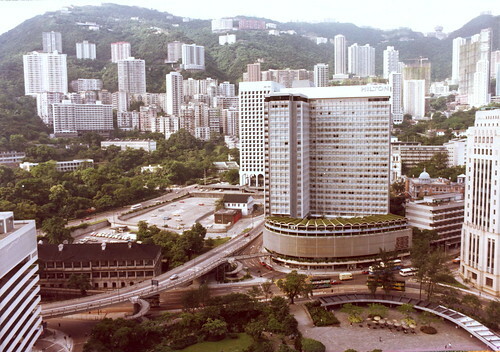 Though the public would be hard-pressed to recognize his name, the octogenarian architect was responsible for many of Hong Kong’s most famous buildings, including Jardine House, the Polytechnic University campus and the late (and often lamented) Hong Kong Hilton, most of which were built under tight deadlines that would shock many contemporary architects. In an era of starchitects, where every new building seems to be accompanied by pompous self-justification, James Kinoshita stands out as much for his modesty as his enduring modernist legacy. James soon began work on Jardine House, which at 585 feet was the tallest building in Asia when it opened in 1973. “[Hongkong Land] had bought the site in 1970 at a record price, so what they were after was to get it built as quickly as possible and to get their return as quickly as possible,” he says. That meant a piling foundation, which was much quicker than the alternatives. “Because of that, the building had to be as light as possible, so instead of a beam and column system, we made a kind of skin around it, like a piece of bamboo – it’s hollow inside with a stiff core outside. It still had to have windows, so we thought of drilling holes in the bamboo,” which is how the famous porthole windows came to be. “Don’t ask me what I think about it,” says Andrew, laughing. Like his father, Andrew is an architect, although he started out by studying engineering. It was an internship at Palmer and Turner that pulled him towards design; he later worked for renowned architect Moshe Safdie before moving back to Hong Kong. He now runs his own firm, Underwood Design, as well as a partnership called TETRA. James says that, of all his work, his favourite building is the Hong Kong Electric Kennedy Road Substation, which was completed in 1970. Vaulted over a waterfall — not something you want close to electrical current — “it involved a lot of structural acrobatics,” he recalls. 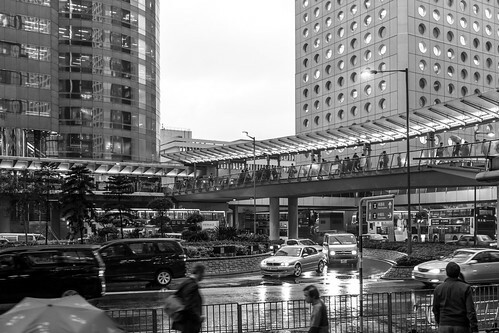 This entry was written by Christopher DeWolf , posted on Sunday January 19 2014at 11:01 pm , filed under Architecture, Art and Design, Asia Pacific, Heritage and Preservation, Public Space and tagged Development, Hong Kong, James Kinoshita, Jardine House, Kowloon, Modernism, Polytechnic University of Hong Kong, Then and Now, Universities . Bookmark the permalink . Post a comment below or leave a trackback: Trackback URL.